Flex Managed Services Limited (Flex IT) was one year old on 1 May 2014 and we have been providing IT solutions to clients for 15 years as part of Dyke Yaxley Limited. In 1998 we recognised the opportunity to outsource Dyke Yaxley’s IT services to clients and other local businesses, and since then the department has gone from strength to strength. 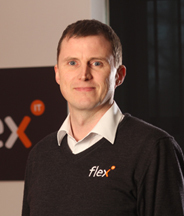 To give our team more recognition and identification as a professional IT solutions provider, we decided to rebrand as Flex IT. We now have a growing team of qualified technicians who have a wealth of experience working with a range of industry sectors across Shropshire and beyond. Ultimately, our aim is to be the IT provider clients thought they couldn’t afford. As a team we achieve this by delivering exceptional IT solutions. Our proactive IT support packages enable problems to be identified and rectified before they become an issue to the end user. We provide business owners with piece of mind, so that they can focus on the most important thing – the running of their business. Our services include support and consultancy, hardware and software supply, installation services and complete networks – Everything IT. We work with a growing range of different clients from all over the county and beyond. Some of the businesses we work with range from professional services, legal, accountancy, financial services, insurance brokers, estate agents, manufacturing, software providers to leisure and tourism. So as you can see a real mix. We also work with some high profile organisations, for example the League Managers’ Association and the Professional Cricketers’ Association. 4. What do you think the future will bring for IT and IT services? Our IT solutions are ever adapting. We are providing more and more cloud-based technologies. These range from hosted email solutions (Microsoft Office 365), online backup solutions, (where we have partnered with industry leaders) through to software as a service solution, (where clients link to individual online applications), through to complete systems being hosted off premises. We are also faced with the challenge of enabling clients to access their information securely on a range of devices including laptops, mobiles, tablets and web connections. 5. Why is it important for businesses to outsource their IT? Outsourcing your IT takes the stress away and immediate benefits can be gained. The pace of change in the IT industry has been astronomical and there is no sign of slow down. Businesses now completely rely on their IT being operational 24/7. Can you afford to not have professionals looking after this part of your business? If you have any questions, please do not hesitate to contact us directly on 01743 235000 or email me at adrian.key@flexit.co.uk.